Scary stuff huh? A lot more than you would expect. 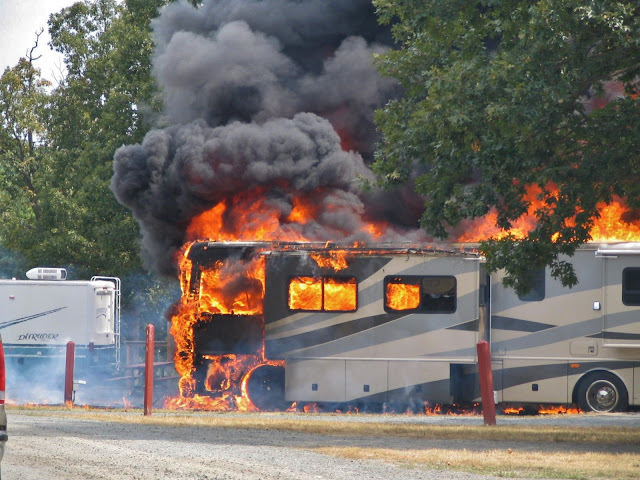 By law, every RV comes with a fire extinguisher. However, like our's in Sherman, most of them are inexpensive dry chemical extinguishers that only meet the minimum as required by law. A dry chemical extinguisher will settle over time, with the powder becoming packed at the bottom. You're actually supposed to remove the extinguisher from it's bracket and physically shake it at least every six months to keep it in prime working order. They even suggest that you hold it upside down and tap the bottom with a rubber mallet to loosen the powder up. I admit that we have never done this, but I will go out and check our extinguisher today! Besides your fixed mount extinguisher, you can buy a two pack of disposable foam spray extinguishers to keep handy. One in the front of your RV and one in the bedroom. For the price, you can't go wrong!! I will buy us a couple when we get into the states next month. I maintain our fire extinguishers and we have 3 of them, always better safe than sorry. Good for you George, as you say better safe than sorry. We have two fire extinguishers. Hope none of us ever have to use one. We agree with you there, Paul and Marsha! I am afraid of fire. I have 2 extinguishers and had them checked 10 months ago. We had a 3 hours hands-on Fire-Alert Safety Course Training in our RV Resort in Casa Grande. That was very helpful. Wow, that is great that the resort you are at held a Fire-Alert Safety Course. I think that would be a great idea for everyone that has an RV to do. Checked mine in July when I went to San Miguel de Allende. It is also paramount to have an escape plan from wherever you are in the rv. You are totally right Peter. It is also important to practice opening and going out of the fire escape window so that you know what to expect should you ever have to use it. Speaking from experience RV fires are a very scary thing..We lost our 2003 Monaco Windsor due to a fire caused by the fridge. Thank God no one was in it and it was parked at home and the fire dept responded quickly. If we had been in it or camping it could have been a real disaster. Sorry to hear about your motorhome but so happy to here that nobody was in it at the time. Yes, once a fire starts it wouldn't take long to spread. Another good reason to also have a good working smoke detector as well as an escape route on top of a fire extinguisher to help you get out safely. You scared me!!!!! I'm checking mine tonight!!!! Glad this was a good reminder for you Karyn Lee, it was for us as well.